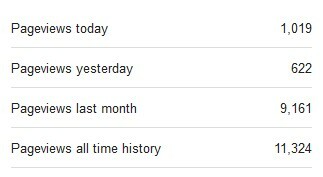 Yesterday the number of visitors reached 10,000 visitors which is not a bad number for a ~2 months old blog. Today, the daily number of visitors reached 1,000 visitors, which I wasn't expecting at all. So to everybody out there that is reading my blog, whether you liked it, hated it, loved it, made you laugh, was boring, just whatever reason, thank you for passing by. Also, a special thank you to everybody that shared my links by re-tweeting, posting on FB, emailing them or whatever way.